How Does the Environment Benefit from Waste Management? Why is VAT Charged by Local Councils to Collect Waste? How is Fly Tipping an Issue? Fly tipping, also known as fly dumping is the illegal dumping of the waste instead of using legal methods to dispose of the waste like local council’s bin collection service or recycling centres. All actions that involve dumping of any types of waste onto land which has don’t have a license to accept the waste is considered illegal. Illegal dumping differs from littering in the way the waste is discarded and by the kind and quantity of the rubbish. Throwing a cigarette on the ground could be an example of littering. On the other hand, emptying a trash bin without permission in a public or private location is thought to be illegal dumping. The term fly-tipping consists of the verb fly which means to throw away casually (“on the wing”), and from the word tip which has a meaning of “throwing something out of a vehicle”. Disposal of the waste is strictly regulated in the United Kingdom, as the majority of households are permitted just to dispose of one 0.2 cubic metres bin of non-recyclable waste and one bin of similar size of recyclable waste per week. If a house owner has more garbage than the previously mentioned allowed limit, they have to take it to the landfill at their own expense. This is the reason why a lot of people just leave their trash in public spaces or woods, parks and similar locations in their residential areas. This is also considered as fly tipping. In the United Kingdom, the main reason why illegal waste disposal is occurring is taxes on landfill. Illegally dumped waste can include green waste, home appliances, abandoned vehicles, construction waste and many more types of waste. A significant part of the dumped waste is potentially toxic or hazardous. The number of persons that are fly-tipping is increasing at the expense of waste disposal rises, and the United Kingdom government introduced an easier way for reporting fly-tipping. The penalty or punishment is usually determined by the local authorities in the area where waste was dumped. BBC announced that fly-tipping costs local councils in the United Kingdom over £50m per year. Places where huge quantities of waste and rubbish are illegally dumped are called open dumps. Usually every person caught fly-tipping at an open dump is issued a penalty notice. 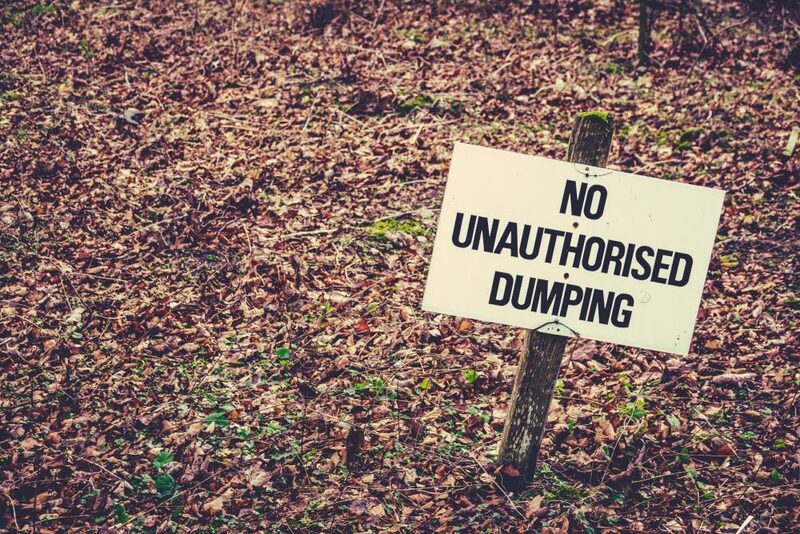 Most often, open dumps can be discovered in woods, abandoned buildings and backyards. Sometimes open dumps are dealt with in short time frame since their creation, but the biggest percentage of them will persist for a very long time when the location is somewhere in the wilderness or even in the public space with no appropriate public services. Waste Management Networks has discovered several websites that might be interesting to our customers and partners. Please be aware that we do not have any control over these websites or their content and leaving their links here does not mean necessarily that we approve them. We merely believe that they could be useful, or vital. Several crucial and fact-filled links will help you with everything you must be aware of regarding the environment and recycling. © 2019 - Waste Management Networks. All Rights Reserved.